[ Carnival meets pilgrimage ] About 3,000 moulids are held in Egypt every year. Part pilgrimage, part carnival, part mystical Islamic ceremony, they are a mass phenomenon that is increasingly attracting the attention of the Egyptian authorities. Tanta, in the Nile Delta, is home to Egypt’s biggest moulid attracting up to three million people, some travelling from as far away as Sudan. 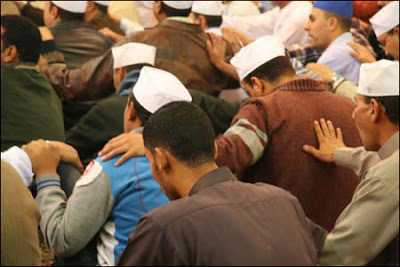 BBC had published In Pictures series on Egypt's Biggest Moulid. Moulid (also written as Mawlid) is the celebration of the birth of the Messenger of God, Muhammad, upon him be peace. The picture series also provides info about Sufism, which has between six and seven million followers in Egypt, about 10% of the population. You can take a look at the picture series here. Photographs and text by Holly Pelham.